After the magnicient time at the mansion dining and walking around the gardens, the group from the ship largely dispersed. Many took the boat back to Portfofino and spent time there-others went back to the ship. I took a walk around the quaint village of Santa Margarita. Lots of cool stores, restaurants, etc. After about 10 minutes of walking, the rain started really pouring down. I found an overhang where I could lie against my camera bag and get dry, and I sat and watched the rsin fall. I watched folks enter and exit the large cathedral across the way. It was very relaxing watching the rain fall, and others get wet, which I was dry. After perhaps 15 minutes sitting down relaxing, I decided it was time to get up. I took a look at the large cathedral across the street. I walked over to the waterfront, and found a red path-literally a red carpet that would led me along the coastline back to the ship. So I walked along the rainy Mediterranean coast, alongside a busy road that led me to the ship. I kept walking for about 15 minutes, looking across the harbor. Finally, the red carpet took me up a footpath in the woods. As my sneakers kept getting soaked, I walked up this footpath, which basically hugged the coast. 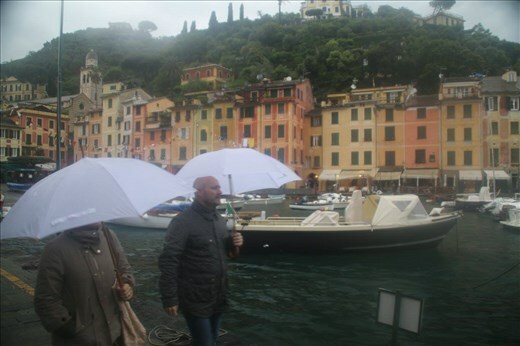 After a good hour of getting soaked, The red carpet let me to Portafino, and all the pretty shops. I looked in some of the stores, and then encountrered a woman I met on the ship having a drink with one of the entertainers under the awning. I sat down with them for a quick coffee under the awening. They asked me if I had been to the castle up on the hill. I haven't-and although the rain kept pouring down, I was determined to see every part of Portafino, including the castle. I walked up to the hill. The rain was still pouring, and it was very windy. But I was determined to see the castle. I walked up the winding road-about 25 minutes, and when I got there-it was 6:00 pm, and it was closed. So I walked back to the place to catch the tender to the yacht. It was easily identifable, because there was an little tent set up that said "Windstar". I waited there alone (with only a guy sitting on a folding chair to ensure I had a ship card, and was a passenger). After about 25 minutes, in the rain, the Tender came on, and I got on alone. The two ship crew members, took the Windstar tent, folded it up, and brought the tent onboad with us. The boat then tore threw the surf in the wind, bobbng up and down. I don't get seasick-but this was pretty close. I then arrived on the ship, learning that they we're waiting for me to get onboard. Because of the bad weather-the captain decided to leave port early, and they we're waiting for one passenger to go-me. Later in the evening, I recounted my story over dinner with my friend, where I got a peace of birthday cake. Later on, we watched the entertainers in the lounge.